Despite a turbulent history during which it was occupied and conquered by a succession of its neighbours and European colonial powers, Dubrovnik is now a city at peace, allowing visitors to make the most of its historic architecture, white pebble beaches, and crystal-clear sea. Political upheaval has at times temporarily discouraged travel to Croatia, but it is also true that this unique Adriatic port city has been luring travellers for centuries, known for its fine accommodation, excellent cuisine, beautiful surroundings, and recreational opportunities. George Bernard Shaw is quoted as describing Dubrovnik as 'heaven on earth'. Over the last few years, the establishment of a stable and prosperous peace in Croatia has ensured Dubrovnik is a booming travel destination once more. The old town, dating from the 7th century, is a UNESCO World Heritage Site. Enclosed by city walls built in the 13th century, the buildings represent a cross-section of medieval architectural styles and remain well preserved. Onofrio's Fountain, situated just inside the main entrance to the old city at Pile Gate, is one of Dubrovnik's most famous landmarks and a popular meeting place. The centre of the old town is the Stradun, its main street, which was originally a channel separating an island from the mainland. 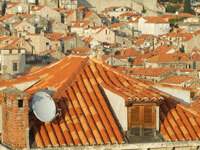 It was filled in to join two towns into the merged city of Dubrovnik. There are lots of churches, monasteries, and museums to explore, while the old town boasts plenty of restaurants, bars, and shops. The coastal belt is awash with pretty marinas, coves, and promenades. Most of the hotels and the best beaches are located northwest of the old town, at Lapad, or in Ploce to the northeast. Dubrovnik is a favourite on European cruise itineraries and many tourists arrive by sea, ferrying in to the charming old port. Although Dubrovnik will delight cruise passengers with only a few hours to kill, it is incredibly wealthy in history and culture and can easily occupy travellers for days. The city is also well situated as a travel hub for exploring the towns and islands that stretch along the dramatic Dalmatian Coast of Croatia.